Reward Health Sciences designed an innovative technology platform to support Accountable Care Organizations by enabling multi-disciplinary coordination of the creation and execution of a patent-centered care plan, the involvement of the patient and their family in the care process, and the capture of analyzable clinical process data to support performance reporting and lean process improvement. 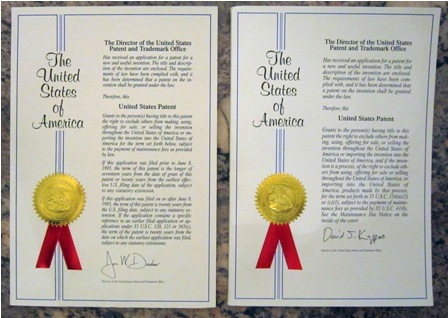 Reward Health Sciences received two U.S. patents for this breakthrough technology (patents #7020618 and #7707057). The key concept behind the Reward System Framework is to adapt web technology and generic workflow automation technology to meet the unique needs of clinicians and their patients. These technologies are widely used in other industries as a platform for enterprise resource planning (ERP) and customer relationship management (CRM) applications. Reward Health Sciences is working to leverage the power of available off-the-shelf web and workflow products, while overcoming the limitations in these generic products that have prevented widespread use for patient care processes. The result of this work will be the Reward System — intended to provide a robust and flexible framework for care process management across the spectrum of diseases and specialties. At the heart of this system is the Reward Care Process Engine, an embeddable component technology used to seamlessly coordinate the efforts of the entire clinical team, including the patient. The Care Process Engine operates as a stand-alone service or can be incorporated into pre-existing practice management, clinical messaging or clinical data repository applications. 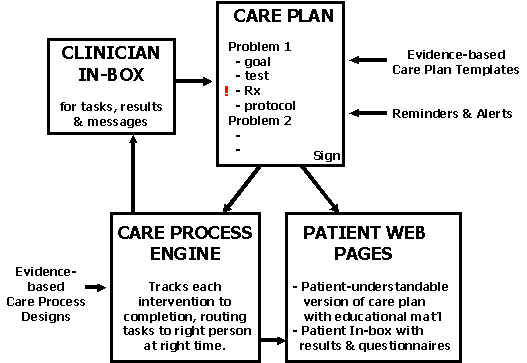 The Care Process Engine serves as a central coordination point for complex processes involving multiple clinical disciplines in multiple locations and multiple legacy systems and devices. Clinical support staff or the physician first uses the system to quickly create a customized “care plan” for the patient, listing the goals and any planned interventions for each health problem being addressed. The interventions included in the care plan can be tests, treatments, referrals or return visits. The interventions can also be protocols, defining a logical sequence of services over time. Evidence-based best-practice templates enable care plans to be created rapidly and consistently. Automated reminders and alerts help to call attention to such things as needed preventive services, drug allergies, or tests that have already been done, addressing the need to reduce medical errors. Once the care plan is completed, the system then uses workflow automation technology to track each intervention to completion, routing the necessary tasks to the right member of the clinical team at the right time. By automating some tasks and assigning the rest to the appropriate member of the clinical team, the overall cost of providing care is reduced, and all team members work at the peak of their capabilities. The Reward System also makes it easy to “outsource” some tasks to third party service providers for such things as telephone counseling, tele-monitoring, patient educational material distribution, home care interventions, and research data collection. The Reward System also enables some tasks to be routed to patients via the Internet. In this manner, the Reward System encourages patients become more involved in their own care. For example, the system can prompt patients to periodically record their health status or medication compliance as part of a treatment protocol. The Reward System automatically translates the care plan created by the clinician to a patient-understandable version that includes tailored educational material. This version can be provided to the patient on paper and via a secure web site. 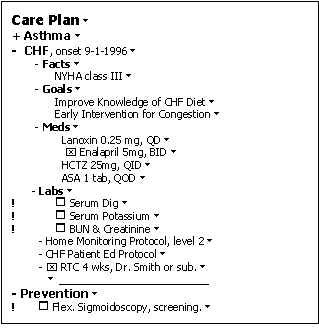 The system also displays the current status of the interventions on the care plan, such as “being scheduled,” “scheduled,” “waiting for results to become available,” etc., so both clinicians and patients have the peace of mind of knowing where things stand. For each clinic encounter, the system generates an “encounter itinerary” providing detailed instructions to the patient regarding their preparation for the encounter, where to go and what to expect. At the end of each encounter, the system generates an “encounter summary,” documenting whom they saw, what problems were addressed, and describing their updated goals and care plan and any associated instructions or educational materials. These reports can help create informed, involved patients with realistic expectations about treatments, recovery and long term prognosis. The Reward System also generates reports and provides up-to-date status information to referring physicians. All of these features are designed to improve the relationship between the medical practice and its key customers, enhancing the position of the practice in the local health care market. The Reward System is also designed to provide analyzable data as a byproduct of routine clinical use. Unlike billing data, the data gathered by using the Reward System are timely, accurate and rich in the clinical detail needed for reporting and analysis. This data can be used to better manage populations of similar patients. It can also be used to generate the utilization, quality and outcomes reports now demanded by employers, health plans and accreditors. Focus on clinician-managed processes, rather than processes managed by medical office support staff or managed care organizations. Provide content that is directly incorporated into patient care, rather than being used for third party authorization or continuing education purposes. Workflow architecture based on robust, 3rd party workflow tools, not hard coded business logic, rule-based systems or home-grown workflow tools. Prepared clinical content within target specialty areas, rather than requiring de novo content authoring by each customer. Specialized workflow task types with health care-specific capabilities such as interfaces to third party systems and services. Offer a robust, extensible workflow automation architecture, rather than focusing on service offerings, data analysis, and single-disease systems. Offer the capability to collect research data and manage research interventions as an integral part of the system used for routine patient care, rather than as a parallel “electronic case report form” process. Use of workflow automation framework for protocol representation. The Reward System Framework was licensed to a large health plan and leveraged in the development of a wellness and care management solution that leveraged a commercial Business Process Management system, integrated with a custom-developed member health record database and “nurse’s desktop” web application. The resulting solution was selected by IBM as one of three solutions worldwide thought be examples of the cutting-edge use of process-centric applications to achieve better business performance through greater “agility”. IBM featured the solution at the IBM “Impact” users’ conference in the Summer of 2010 in Las Vegas. The following YouTube clips published by IBM cover this “main tent” presentation to over 5,000 attendees.